The chapter seeks to problematize the policy requirement to promote “Fundamental British Values” in English schools. Historically, research shows Britishness to be fluid, evolving, and often difficult to define for White British and ethnic minority young people, as well as for pre-service student teachers, classroom teachers, and teacher educators. Recent research conducted with pre-service student teachers is outlined in this chapter to evidence intersections between nation, identity, and belonging that schools could explore. I analyze the teaching and learning of Britishness and “Fundamental British Values” as complex processes. I recommend for students and teachers to engage in reflective and collaborative classroom activities about identities and belongings. Critical pedagogy and arts-based pedagogies are recommended as possible useful teaching and learning approaches for young people and teachers who explore identity issues in the classroom. Allan, L. (2017). Lucy Allan MP: Prevent is not working, and it undermines trust between teachers and pupils. PoliticsHome. Available: https://www.politicshome.com/news/uk/home-affairs/terrorism/opinion/house-commons/82786/lucy-allan-mp-prevent-not-working-and-it. Accessed 21 Apr 2018. Berkeley, R. (2011). True multiculturalism acts as a bulwark against further extremism [Online]. Left foot forward. Available: http://leftfootforward.org/2011/02/david-cameron-wrong-on-multiculturalism/. Accessed 24 Feb 2016. Brett, P. (2007). 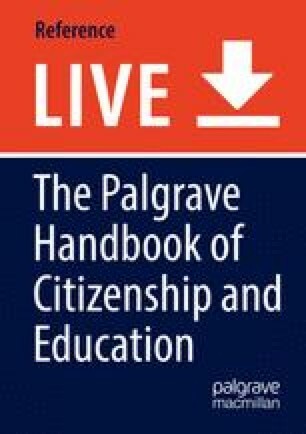 “Endowing participation with meaning”: Citizenship education, Paolo Freire and educating young people as change-makers. Available: http://www.citized.info/pdf/commarticles/Endowing%20Participation%20Peter%20Brett.pdf. Accessed 16 Oct 2018. Cameron, D. (2014). British values aren’t optional, they’re vital. That’s why I will promote them in EVERY school: As row rages over ‘Trojan Horse’ takeover of our classrooms, the Prime Minister delivers this uncompromising pledge… [Online]. The Mail on Sunday. Available: http://www.dailymail.co.uk/debate/article-2658171/DAVID-CAMERON-British-values-arent-optional-theyre-vital-Thats-I-promote-EVERY-school-As-row-rages-Trojan-Horse-takeover-classrooms-Prime-Minister-delivers-uncompromising-pledge.html. Accessed 26 June 2014. Giroux, H. A. (2018). Educated Hope in dark times: The challenge of the educator/artist as a public intellectual [Online]. ArtsEverywhere. Available: https://artseverywhere.ca/2018/03/20/education-democracy/. Accessed 5 Apr 2018. Grayson, J. (2012). The strange xenophobic world of coalition integration policy [Online]. Institute of Race Relations. Available: http://www.irr.org.uk/news/the-strange-xenophobic-world-of-coalition-integration-policy/. Accessed 6 July 2014. Walford, C. (2012). ‘We need community cohesion’: Ministers’ pledge to end era of multiculturalism by appealing to ‘sense of British identity’. [Online]. Mail online. Available: http://www.dailymail.co.uk/news/article-2104049/Eric-Pickles-signals-end-multiculturalism-says-Tories-stand-majority.html. Accessed 6 July 2014. Walters, S. (2014). Be more British Cameron tells UK Muslims: PM issues powerful new pledge to combat extremism. Mail online. Available: http://www.dailymail.co.uk/news/article-2658033/Be-British-Cameron-tells-UK-Muslims-PM-issues-powerful-new-pledge-combat-extremism.html. Accessed 7 Apr 2016.